Last week at Comic-Con CBS debuted a “First Look” trailer for Star Trek: Discovery season two. There’s a lot to unpack: Captain Pike takes command of the USS Discovery, a galactic mystery is brought to light, Spock is talked about, an engineer cracks wise, a Saurian sneezes, and more! We’ve grouped the screenshots by theme, while it’s not 100% certain, it’s pretty clear some of the bits we see throughout the trailer belong together. The story theme for season 2 has been described as “the struggle between facts and feelings and faith,” and we see something of that in the first few minutes of the trailer. In the middle of explosions and panic Burnham has a moment, she looks up and sees a strange being. Who could forget the cliffhanger ending from season one? Captain Pike beams aboard the USS Discovery and takes command. He cites Starfleet Regulation 19, Section C — a directive for taking emergency command of a starship when an imminent threat is detected. Pike and his team (Lt. Nhan and Lt. Connolly) beam onboard. Check out the new transporter effect. Pike describes the mysterious seven red bursts, which are spread out over 30,000 light years. The question remains as to why Pike needed to take command of the USS Discovery. It could simply be that the Enterprise was out of commission, or it could be that there is special technology available on the Discovery that suits his mission. In the trailer we see a group of spherical devices deployed, which may be equipment unique to the Discovery. Saru, Lt. Connolly (blueshirt), Lt. Nhan (redshirt), Burnham, and Pike walk through the Discovery corridors. Note how they look up at the spherical devices. We get a look at Spock’s quarters. Check out the TOS-like circular grid used as a room separator. Spock’s quarters also have red walls possibly as a nod to the red curtains we saw in TOS. Also in his quarters are a 3D chess set, a Vulcan lyre, and Vulcan ceremonial chimes. Wide shot of quarters, note the Vulcan chimes on the left and the lyre on the right. Burnham accesses Spock’s logs. Note the Vulcan script on other parts of the computer terminal. Burnham realizes Spock has been tracking the seven red bursts. Note the 3D chess set next to the computer console. The Discovery leaves the Enterprise behind, from the worker bees we see around the Enterprise, it seems as if it was damaged. Possibly from trying to navigate the rocky area of space we see in the trailer. The Enterprise under repair by a worker bee next to the Discovery. Likely another kind of special scientific equipment the Discovery was carrying, the ship launches special single person craft to navigate the rocky area of space. The cluster of small ships whizz around the rocks with the Discovery in the distance. A good look at the small ship. From the looks of things, this nasty place is where we’ll encounter the USS Hiawatha, or what’s left of it. We also get our first meeting with Tig Notaro’s character Chief Engineer Reno of the USS Hiawatha. Pike steps through a room seal, phaser first. Burnham is blown backwards as things explode. Note the older transporter design, perhaps part of the USS Hiawatha? Tilly and Stamets cook up some new “weird science” in the shuttle bay. It looks like a device for a fragment of the rock found in the mysterious region of space. Stamets, Tilly, and other Discovery crew members look on at the device. Here are few other moment from the trailer. Note that Captain Pike changes uniforms into the standard Discovery version after he takes command. Saru looks at the viewscreen, threat ganglia at full attention. Linus touches his throat, he has that virus that’s been going around. Poor Lt. Connolly looks quite resigned to having alien snot on his face. It looks like the Hiawatha may be wrecked in the rocky region of space. This press shot from CBS shows us a crate from the USS Hiawatha (far left) and lots of rubble. Zoom and rotation of the crate label. The redshirted officer Pike brings with him to the USS Discovery is named Lt. Nhan, played by actress Rachael Ancheril. Nhan appears to need a small breathing apparatus and has alien makeup similar to the Barzan species from TNG: “The Price.” Of course there are certainly other alien species out there that might need different mixtures of gasses, so she may not be a Barzan at all. We’ll hopefully find out more in the new year when Discovery comes back. This “First Look” trailer appears to be primarily be from the first two episodes of Season 2. There’s quite a bit more to the season that we have yet to see. We know Discovery will continue to follow the Klingon politics on Qo’noS with Chancellor L’Rell and Voq/Tyler. We also know Dr. Hugh Culber will return. Michelle Yeoh is also returning as former Emperor Georgiou, in a Section 31 plotline. While Rebecca Romijn was announced at Comic-Con to be playing the Enterprise’s Number One, she was also a no show in the trailer. And lastly, but certainly not least, we didn’t see Spock, but of course that’s purposeful, Spock is not onboard the Enterprise right now, however it’s all but certain we’ll catch up to him at some point later in the season. Rebecca Romjin tweeted this photo holding her USS Enterprise crew Starfleet badge. I have to ask: is there anywhere in canon – the prime universe Tv series and movies – where it’s explicitly stated Kirk took over the Enterprise directly after Pike? Not just assumed to have? I don’t recall such, and if thats true, how do we know Pike didn’t command Discovery after Enterprise with another unknown captain between Pike and Kirk? Absence of evidence of said theoretical captain doesn’t not equal evidence of absence. I only recalled Spock and Kirk during The Cage saying Spock served under Pike before Kirk, which doesn’t necessarily mean DIRECTLY before Kirk. Kirk said he met Pike once when he was promoted to Fleet Captain from Captain of the Enterprise. That implies that both were on the Enterprise when the change of command took place. Not necessarily. That promotion ceremony could have taken place somewhere else, like Starfleet Headquarters. You could also be very much correct. Not to say that a few months attachment elsewhere before returning to your regular duties couldn’t be included in that figure. You’d still nominally be serving under Christopher Pike, even if you or he has to work elsewhere temporarily. Which again points to Spock being substantially older than Kirk. 13 years ago plus 11.45 years… is a lot. Not unlikely, given that Vulcans are established to live a lot longer than humans (or at least have been since then). For example T’Pol being in her 60s and a youngish Vulcan. In TOS, it was first mentioned when we saw Sarek in Journey to Babel he was already 102. By the time we saw him in TNG he was probably around 200 by then. So yes T’Pol was probably still considered quite young. In one draft of TWOK (the Sowards version that introduced Saavik, though as a male), the crew sing Happy Birthday to Captain Spock on his 80th, which would have firmed up just how much older Spock is than his compatriots. I think that might be in conflict with YESTERYEAR, but at least isn’t the howler that Freiberger had to say, claiming to Fontana that McCoy and Kirk are contemporaries and therefore the doctor couldn’t have a legal-aged daughter. Those two numbers don’t add. The stuff in “The Menagerie” happened thirteen years ago, and those 11 years and change were part of those thirteen years. We know this because in “The Enterprise Incident,” the Romulan Commander asks Spock how long he’s been a Starfleet officer, and he tells her 18 years. In several parts of TOS, it’s implied that Spock is the same age as Leonard Nimoy, who was 35 during the first season. In “Journey to Babel,” Amanda says that Sarek disowned Spock when he joined Starfleet, and it’s said that Spock and Sarek haven’t spoken for 18 years. Kirk is younger than Shatner, but only by a couple of years. Kirk says in “The Deadly Years” during Season 2 that he’s 34, at the time that Shatner was 36. So Spock is around 2 years older than Kirk. Well, there it is. Forget what I said about him possibly having a point. A note on that 11 years, 4 months, 5 days. Spock would likely not count any extended leaves from duty as part of this time. Don’t think it matters where that happened. I think it did imply, however, that Kirk directly replaced Pike as Captain of the Enterprise. I do fear that Granite Trek as a possible point. That it may not be as cut and dry as many think it is. But if not, that means that Spock had LESS time with Pike so the immense loyalty he felt for him had have been earned quicker or in some other way. Please go back and re-watch The Menagerie…this is all explained conclusively such that this is not an issue. If they actually only said “Captain Pike,” couldn’t they be referring to, like, Captain Tim Pike? It MIGHT not mean Christopher Pike AT ALL! Why are we assuming there’s only ONE Captain Pike in Starfleet?!? Yeah, I think the U.S.S Hiawatha is either severely damaged or destroyed and Reno is the only survivor. I think the Discovery will take her as chief engineer. Also I have a theory that Captain Pike might be secretly working for section 31, but later on throughout the season he gets annoyed with their methods and tactics and might want to expose them which can lead to Section 31 organizing the accident that cripples him. Or maybe Section 31 doesn’t want the Discovery exploring those red matters. Either way, I think they might be involved with Pikes accident down the line. Good reasoning. You might be on something there. Although Pike’s actual accident will happen years later. Woah love that Pike/Section 31 tie in. That would be cool! And it would make us see his mission in a whole new light. I don’t like the idea they crippled the guy later on though. They are ruthless (OK they did try to blow up the Enterprise in the Kelvin verse) but they usually don’t go about trying to hurt or kill other Starfleet officers. I have a feeling if there is a danger of exposure, they can sure resort to more absolute measures like killing or hurting officers. Weren’t they the ones trying to blow up an entire planet to end the Klingon war in the first season? If they are willing to blow up an entire planet, it is possible they can resort to hurting and killing Starfleet personnel for their own protection. No, I think that was (sadly) just Starfleet trying to blow up the planet. Technically we never saw Section 31 in last season. I guess you can argue though Crawford could be (and a lot of people DID think Lorca was before we found out he’s even worse lol) but no it was never made clear Section 31 did it. And I guess I don’t believe they go about hurting other officers (again, with the exception of trying to blow up the Enterprise ;)) because you had people like Bashir and Archer knowing exactly their plans and nothing ever happen to them. I’m not saying they can’t be evil but they don’t seem to go out of their way hurting other Federation people. But you could be right but I think if they did that with Pike it would make people hate S31 vs now where they are seen mostly as antagonists and not complete villains. Again, except Marcus and he got his! I think even if this happens it will be a long term situation because we know there are still many years until Pike’s accident, I don’t think they will deal with it this season. Perhaps if they make that Pike spinoff, it could be incorporated there. Even though they said it was starfleet who thought up the idea of blowing Chronos, I think section 31 definitely had their fingers in that decision behind the scenes. I remember reading somewhere that this season was gonna have lots of section 31 so this made of think about this theory. Perhaps we will finally see how deep they really go in the Starfleet hierarchy. Perhaps Pike is gonna witness something that section 31 will need to be absolutely hidden unlike Archer or Bashir. Anyway these are all theories and long term ones, I don’t know what’ll happen in the short term. You could be right but since this is all just high speculation its hard to say either way. But I wouldn’t mind him involved with Section 31 at least. Sloan tried to kill Julian and Miles when they were in his head. The show has great effects, good actors,good direction, but…..IT AIN’T STAR TREK. Oh, and the guy playing Pike…….has ZERO charisma.I mean NONE. Fortunately, you do not get to decide what is Star Trek. And no offense intended, but you lost a lot of credibility recently with your rather mean-spirited comments regarding Saldana. Gatekeeeping on Trekmovie? I really want to be surprised but I’m not. This site has devolved in a cesspit of toxicity. Well, I have quite a few grumbles about Discovery, but this is not one of them. I don’t think he lacks charisma and his resemblance to Jeff Hunter is notable. I think it is quite an effective bit if casting. In contrast their Spock will almost certainly not be a patch on Nimoy. I’m not a fan of the series (so far), and agree that it many ways it isn’t “Star Trek” (meaning “what I think of as Star Trek”); but Anson Mount is an excellent actor, and a great pick for, uh, Pike. I am forced to admit that it was a great choice for Pike. I’ve seen him in other roles and he’s pretty good and does bear a little resemblance to Hunter. For my money Nimoy was always my favorite part of Trek. The best actor, the best character. Spock, more than any other character, even Kirk, encapsulates what Trek is about. That said, I welcome a new interpretation. Quinto is certainly no Nimoy, but what I like is that it is a fresh take. As long as Discovery keeps him consistent with Prime Spock in tone I look forward to someone new in the role. My only ask? Someone with a great voice! The biggest problem with Frain as Sarek is not the writing or even the performance, but that he doesn’t have a distinctive, stern voice. It’s why Cross in the film works better (though im not really down on Frain, he has done well, just not what I was hoping for). Oh I agree with the distinctive voice comment. Frain also seemed to have trouble with the American accent, he should have used his natural British accent. As far as I know Vulcans don’t have distinctive accents. I think Mr Frain played the role very shallowly, I hope they do a better job with Spock’s casting. I totally agree about the voice. As good as Quinto is the voice just doesn’t resonate as Spock. Other parts the voice does not matter as much. But Nimoy’s voice was just too distinctive. There was a guy in that Las Vegas Trek convention ad who had a good voice for the part. I guess it’s just a tough find. Looks, acting skills AND voice. It’s not Star Trek, it’s Star Trek Discovery. Harry, I think you mean he’s not Canadian, like Bruce Greenwood? He had more ‘charisma’ than Jeff Hunter did, for sure. And his Pike was a far different person. I think slow-burn and serious is the way to play TOS Pike. I like Anson Mount in the trailer, and I’m ready to give him a shot. Not only does Mount ooze charisma (please familiarize yourself with his other work), he is dripping with it in this trailer. If you don’t see it, than maybe televised dramatic entertainment isn’t for you. Perhaps you’re more of a radio drama kind of guy. Love this casting. Been a fan of his for years and nice to see him get a role in a big franchise that gives him something to do (unlike the dreadful Inhumans). Yeah, I hope people don’t judge him from Inhumans, that wasn’t really his fault. He was excellent in Hell on Wheels, people need to check him out in that. Hell on Wheels had its share of flaws, but lack of charisma from its lead wasn’t one of them. Since the red thingies are spread out over 30000 light years, I assume that Pike is takinng Discovery so that he can use its spore drive to get to them in a timely manner. Yeah that’s what I’m guessing as well. We know its coming back next season. Yeah, kinda obvious as Warp is far too slow. Even though I find the whole ‘Pike showing up and taking over Discovery’ thing a bit too fanboyish I honestly have to say I have little complaints with this trailer. It really did hit all the marks I felt was missing from last season. And I realized there were still stuff I missed even after seeing it nearly 10 times now so thanks TM! I DO want to love this show and so I’m hoping next season lives up to the name Star Trek more than first season. And not just a bunch of fan service either. One thing that I hadn’t thought about until I read this article was the idea of the Enterprise being damaged, though it would explain the Priority 1 distress call. So… we have a starship which i badly damaged while investigating an anomaly and its captain taking command of the first passing starship in order to go back and investigate said anomaly. The fan in me is flashing back to “The Doomsday Machine” but with less crazy. Also, I’m wondering whether Tig Notaro will end up as Chief Engineer of Discovery or Enterprise. Don’t think you are alone in thinking that. Maybe they should hook up. That would be wild. I agree Tiger. Pike and the Enterprise just oozes with fan service. Something I’m forced to admit I get a huge charge out of. But just don’t think this show earned such a move yet. I’d rather see them stand on their own two legs before they reach for help from the franchise like that. It just feels desperate to me. Like they know their shortcomings from S1 and feel they need this crutch more than ever. That said, the trailer DID make it seem like it would indeed be much better. We should reserve judgement on that until we see the final product, however. I’m one of those people who eye roll every time I think of a Pike spin off show people bring up because while I don’t mind a Pike show in theory I just want something original again. One of the things I like about DIS is that its original with its own characters and ship. But yes it clearly was designed to have TOS characters show up when they are needed, which I’m OK with if its done in small doses. But now knowing Pike is in practically every episode next season has created my worst fears. It could be great of course but its sad they have to rely TOS characters to bring in fans. All I can hope is that they have a viable reason to do it beyond the obvious. We know “Pike is in practically every episode” next season? I think it makes a lot more sense to have him in the first half of S2, then spin off with the Enterprise into another show, while Discovery takes off on her own. You guys are right though, all the Enterprise stuff seems to have a whiff of desperation. Here’s hoping it all pays off really well! I think it was in one of the interviews where they asked Anson Mount how many episodes will he be in season 2 and he said all 13 of them. Trekmovie: They’re still shooting, so was it an arc or are you a season 2 character? Anson Mount: Oh yeah. I’m contracted. Trekmovie: For the whole season, I meant. Main cast, whole season? I agree, I hate how Discovery is sort of co-opting Trek history to tell its own thus far weak stories. At this rate Season 3 will see Kirk show up. But it sounds like with this Section 31 B plot in this season and the destruction of Hiawatha they’re really sowing the seeds for a true ‘cinematic’ universe this season with their characters. So like yeah, using TOS as a crutch is uninspired. From this trailer it seems likely, unlike last season, they’ll make good on the premise this time. I absolutely think we will see Lt. Kirk on the show at some point. I’d wager money on it. Could Burnham be seeing an Iconian? 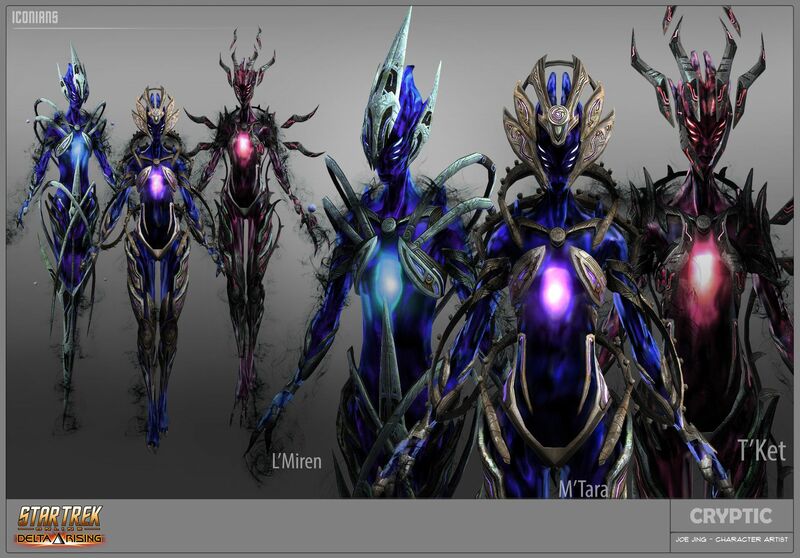 I won’t lie but I completely forgot who the Iconians were lol. This theory has been on Reddit as well. I had to look them up and remembered their gateway technology was shown once on DS9. It would be great to expand on a mysterious advance species that has gone extinct. Again THAT’S Star Trek to me. I would totally welcome that if its true. I thought it looked quite organic, and sort of like moist, sideways, er … lips. Just throwing this out there, it could also be, a Q, a Prophet, Organians, the last Douwd (TNG The Survivors), lots of things. Thank you, Trekmovie. Love these magnifying glass articles. Great. It’s a big metaphor for being woke. Well, so be it. It’s fair material for Trek to cover, so why not? Hate to do this, but… I’m really starting to hate the sloppy collar look. Asymmetry? That’s what the big ‘A’ on the left nippy is for. It’s probably a Vorlon outside of its encounter suit. Great recap, Matt. You did a masterful job piecing together the disparate clips into cogent sections. I agree the trailer looked and felt great — and included the lighter touch and sense of adventure missing from a particularly dour Season One. The spinny globe pods, swerving camera, lens flares, warp drive effect and Captain Pike saying “Hit it” all have a lot more in common with Kelvin Trek than Prime Trek. I guess that’s just the new standards this current generation of new fandom has come to expect. I know the properties are owned by two different entities — maybe the connective tissue is Alex Kurtzman? And yes, I know it’s probably not the best thing to call a person connective tissue, but there you have it, I said it. TrekMovie has, at every key Star Trek moment in the past 12 years, stepped up its game. Better coverage, better website design, and the ShuttlePod is really hitting its stride. Congratulations on being, without exception, the premier Trek information site. If TrekMovie is the portal to all things Trek, then I’m going to call Tony Pascale “Mr. Atos.” Keep up the fantastic work! Then you are going to love the lack of delayed gratification in Connery’s ZARDOZ. I actually never picked up on that until Ben Stiller mentioned it in some clip of him speaking about how much of a Trek fan he is. Re: Mount’s choices for Pike (having fun and ruffling feathers). Hunter played Pike as a serious, no-nonsense leader and, though not entirely humorless, with certainly no more than a very subtle sense of mischievousness. Hunter’s Pike was, to his crew at least, reserved. By the time we’re introduced to him (in the Cage), he’s struggling with self-doubt, and emotionally, psychologically weary. One of the joys of seeing Shatner’s Kirk follow Hunter’s Pike, was the difference in their respective character’s attributes and behaviors. This isn’t a comment on Mount’s talents, he seems great. I’m sure he’s approaching the role as the producers have dictated. Which is why I’m dubious. My reading of the recently anointed all-powerful showrunner’s work – past and present – is that we’re in the midst of a tent-polled, market-studied re-imaginaing. One that cranks up the adventure, focuses on appealing “internationally” and intentionally or not, essentially drains the property of much of it’s individuality and dramatic weight. In that case, right, there’s no room for a sullen, navel-gazing starship captain. Sullen navel-gazing Pike was why I disliked him in “The Cage.” I attribute that more to the writing, which, it being 1965, was not the best. And that Pike was devoted to Starfleet ideals of freedom. I loved Bruce Greenwood’s Pike because he was like a real captain, a trifle impatient, a trifle playful, and all business when it came down to possibly sacrificing his life. I’ll wait to see what Anson’s Pike is like. Hopefully he’ll have some of the Greenwood spirit. I think (hope) Mount’s Pike will be a blend. The events of “The Cage” was an incredibly low point for Pike, we saw him at his lowest and most self-doubting. Discovery season 2 is 3 years later. It seems like the events of “The Cage” may have snapped him out of his funk, and made him re-think things. In the episode he literally gets to revisit his home life, the mission he was just traumatized by, and even one of his escape fantasies, none of them were really satisfying. Of course he also knew they were artificial, even so, perhaps it helped him realize he’s right where he should be: commanding a starship. Brought to my attention Kurtzman had no involvement with Lost. Never watched Fringe, but friends were fans, so I’m still hopeful. Much as I enjoyed this trailer, and knowing that every captain is somehow required to have THE line. “Hit It”, just fell so flat to my ear. I can’t tell you what a better line would have been, just that this one, landed with a dull thud. At least “engage” or “punch it” have been established. Heaven forbid they should stick to something previously established in this series. It would’ve been nice if he at least said punch it to have some connection to Kelvin Pike. It just proves how much CBS want to keep this show separate from the movies when they can’t even have the same characters mimicking lines lol. Many thanks for these step-by-step breakdowns, Matt. Excellent work. I think Anson Mount is going to be a standout this season. Excellent actor, great casting choice. Could that “strange being”, be an… Iconian? Ooooh, nice callback (forward?) to the TNG S2 episode “Contagion”! Star Trek Discovery is TOTALLY Star Trek. 100% through and through. I get the Trekker feels when I watch it. Oh, and could the red bursts be the start of the formation of The Great Barrier seen in Where No Man Has Gone Before? I don’t think The Great Barrier is cannon anymore. JJ Kurtzman’s 1998: A Space Odyssey. I want to get away. If Burnham doesn’t play that Vulcan lute at least once, I will consider this season an abject failure. The mysterious signals are intriguing but this whole business of running into the Enterprise & its crew reeks of small universe problem. The ‘Discovery’ team should listen to Simon Pegg in this regard. Don’t think that really applies here as the Enterprise crew will be significantly different to TOS. Out of the hundreds of Federation ships out there, they happen to run into the USS Enterprise. Captain Pike, Number One and Mr. Spock are all familiar characters from TOS. Obviously we know a lot more about Spock than the other two but we also know a bit more about Pike. None of them are new blank characters. When you add the already familiar characters like Sarek, Amanda, Mudd & familiar alien race like the Klingons the world of ‘Discovery’ feels like a very small world. Spock has gone missing after the Enterprise picked up signals from sources scattered across 30,000 light years. Spock’s father and foster sister happen to be aboard the only Starfleet ship with the experimental technology to reach these signal sources. It makes perfect sense for Pike to be there. The only reason Pike is there is because the writes wanted to use a familiar character. Take Pike and his ship out and replace them with a new crew. A Federation ship picks up mysterious signals, its captain seeks out the USS Discovery to use its experimental drive and tech. A new ship, a new captain with no prior history. But rather than coming up with new characters, they chose to reuse the iconic ship and bring back Spock, Pike and Number One. Having Pike taking over the USS Discovery and hanging around all season long will overshadow the Discovery’s crew. They’re basically saying that the show can’t stand on its own and needed the USS Enterprise and its iconic original characters. Yep. Agreed completely. I’d be a little embarrassed by it if I were involved with STD in some way. Rofl, you guys would be hilarious if corporate reality actually worked that way. CBS doesn’t care about me, you, or anyone else, they care about the bottom line. You don’t renew a failing show, and you don’t hire the guy in charge of it to make several more shows in the same setting. I mean come on guys, your not even thinking here. The point was more about the creative direction of the show. As for the financial success, according to Moonves himself ‘Discovery’ was profitable before shooting a single frame thanks to the Netflix deal. Reason why CBS is making more shows has little to do with ‘Discovery’ itself and more with their streaming services CBS AA & lack of content on it. Despite looking on tbis whole show as being set in an ‘alternate universe/timeline’ to the ‘Prime’ and ‘Kelvin’ ones, I’m curious to see what it’s version of ‘Pike’ gets up to. And I’m certainly intrigued to see how it’s eventual version of ‘Spock’ turns out too – other than having pointy ears, I’ve no preconceptions as to how the character will be portrayed in this, and the character might even turn out to be a female version in this show for all we know! So I’ve no qualms about whoever gets cast as younger ‘Spock’ in this, just as I’d have none if they ever re-cast a younger ‘Picard’ and co. for any future show. They have talked about her foster brother Spock so making Spock a woman would contradict their own show. Discovery is Prime Timeline where Spock is male, the Kelvin Timeline crew did meet gender swapped versions of themselves in the IDW comics, Captain Jane T Kirk & crew. @Cervantes, of course you realize in that timeline a female Sarek married Adam Grayson, Michael is a guy and Sybock is also female. @ Who cares – No, I wasn’t aware of that either. But as the precedent has been set for certain characters in that particular Trek timeline, I’m sure that there’s room in some imaginary ‘alternate Trek universe’ for a similarly ‘alternate Spock’ to transpire! Thanks for the breakdown, Matt Wright! I’m hard of hearing, so I can’t actually hear much of the trailer, and it’s great to have your analysis so I have some idea of what happens in it. The Netflix version of the trailer has subtitles although they are sometimes not quite accurate. Maybe you can find a version with subtitles on Youtube. I like that we finally get to see Drones on Star Trek. It’s incredible how much makeup has evolved since the days of TNG. I’m very, very happy Disco is here to upgrade Trek’s visual look. It was mired in the 20th century and looked dated af. At least Disco *looks* convincing by today’s standards. I wish they didn’t use bright blue HUD displays which gives me this cold sci-fi feel. The Saurian has a believable look to it, but still gives off this appropriately alien “aura” I suppose. And with the storylines being teased, between the Ent being damaged, the Hiawatha being destroyed, the red lights in the sky and Spock, and the Section 31 and Klingon storylines continuing from last season, it seems like the producers may actually have a plan here for how to flesh out the universe in Season 2 and beyond. Maybe TOS becomes our most in-depth era of Trek history ever, because all these threads they’ve been weaving will come together to form a universe as rich and real as GOT. If the writers can do manage to that, of course. It is looking rich, like a good season. Altering the visual look to fit in with TOS would have been better, like how Enterprise did it. I might like this season of DSC better, but I think DSC will be my least fave show. Yep. After the first season STD is by far the worst Trek series ever. And it’s not even close. Altering the visual look to be more in line with what we viewers have been shown that era looks like would have been wise. But the show still would have been amazingly sub par just because of the weak storylines, idiot plot twists and boring main characters. The worst mistake they ever made was leaving the TOS era. I just can’t understand why some people want the show to be set in the far future for no good reason what so ever. We’ve only seen a few snippets, granted, but it dawned on me that Mount is channeling Kirk in his affect/demeanor more so than Pike. I don’t sense any of the angsty guy from The Cage. As has been said by others below, thanks, Matt, for the breakdown and analysis. It’s always helpful, because I always miss things! I love the theorizing too. I have to say there are still a few visual changes that I am not keen on, but if I let go of it and try and enjoy DSC for what it is , rather than not liking for being too different from the past. I do wish they made a better effort to look a bit closer to TOS and still do an update. But season two does seem to be a bit of an improvement over season 1 which was tough for me. It’s nice when an elegant homage to prior art comes about, but it was never a demand of the canon that the fans kept in anticipation of the very distinct possibility that we would never see its like again and the chance that the nearly bankrupt Studio would ever go to the expense to archive it. The stories and their words were always utmost in importance for the fans of the era in regards to preservation. – So far, Mount’s Pike seems to come off like a blend between Hunter’s Pike and the Greenwood’s Pike. – While most of us prefer to see Pike in the TOS-inspired uniform, I guess him switching to the uniform of the ship that he is currently (temporarily?) captaining makes more sense in-universe.